Mugsy's Rap Sheet » Puerto Rico Crisis the Result of Years of Conservatism. Coming soon to a state near you. 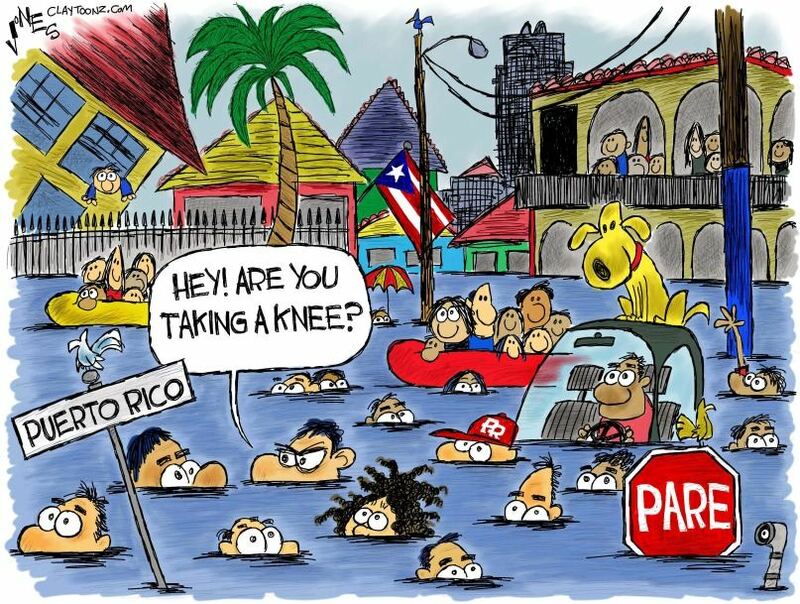 I will admit I know very little about Puerto Rico other than the fact it’s an island in the Caribbean, it’s not a state, and everyone there is an American citizen… which I’m certain is at least one thing more than Donald Trump knew before last week. So when Trump responded to the crisis in Puerto Rico by attacking them for their poverty instead of showing the same concern he showed Texas & Florida after their respective hurricanes, it was doubly insulting. Not only did he decide that the middle of a humanitarian crisis was the time to blame them for how poor they are, but the fact is, Conservative policies… like the one Trump is planning to roll out with his massive tax cut for the Super Rich… that are to blame for their economic state. Rather than dive into the weeds of tax policy and attempt to explain why all this was very illegal, just understand that all these Republican tax loopholes that allowed corporations to hide in Puerto Rico to avoid paying taxes and turn it into an economic black hole, was made even more devastating following the massive global economic crash Bush’s final year in office, putting what few corporations left hiding in PR out of business and taking what few jobs they provided with them. During the 2016 presidential campaign, there was an effort by the GOP Congress to inflict mandatory “austerity” measures upon bankrupt PR until they repaid their massive debt to the government… with no say in the matter themselves. I wrote about this back in June of last year when Hillary supported the GOP plan and Bernie opposed it, visiting Puerto Rico before their primary to receive his usual large reception. (The mayor of San Juan… Carmen Yulín Cruz… whom we’ve seen on TV quite a bit recently after being attacked by Trump… made headlines last year when she joined with the former governor to switch her support from Hillary to Bernie, after which Hillary declared she too was now opposed to the GOP austerity plan and never really supported it. But I digress. Turning Puerto Rico into a massive tax shelter where corporations moved there to avoid paying income taxes and consuming local resources without paying for it, was strike one. Resulting in few jobs and no tax revenue to put into rebuilding their infrastructure. The GOP Congress imposing “austerity measures” upon them (with no say in the matter) when they were already bankrupt with an economy that was decimated by the crash on 2008, was strike two. And… arguably… the devastation caused by two Cat-4 hurricanes just weeks apart was made even worse by Republican denial of Climate Change, making these storms exponentially more destructive. Strike three against Puerto Rico. They called it “Trickle Down economics”, the theory that giving massive tax breaks to corporations and the wealthy, all that wealth would eventually “trickle down” to the rest of us in the form of jobs and investment. The problem is, corporations don’t reinvest their savings back into the company without incentive (like a tax break in exchange for doing so) or unless there’s a need for it due to increased demand. As Keynesian economics proved, money doesn’t “trickle down” like rain, it is “absorbed up” like a sponge. Put the money in the hands of those who spend it and they create DEMAND, which forces companies to expand to meet that demand, hiring more people who buy more products, thus creating more demand. It’s not just theory. We have decades of economic history… both Republican and Democratic… to prove it. Reagan cut taxes for corporations and created an economic crisis that tripled the entire accumulated 204 years National Debt in just eight. Poppy Bush tried to follow suit, but the man who coined the phrase “Voodoo Economics” tried to do it without the massive borrowing Reagan relied on to fund the government and ended up creating a nasty recession that cost him his job. Then Bill Clinton took office and raised the top tax rate 3%… which Republicans claimed would throw us into an even deeper Recession than Poppy Bush put us in. The result? Not only did we see the healthiest economy in fifty years, but unemployment fell to a stunning 3.9% (which the Republican congress tried… and continues to try to this day… take credit for) and a balanced budget. Then Bush Jr took office claiming that being able to pay off our Debt only proved we were “overtaxed” and therefore deserved a tax cut (which is EXACTLY why no Republican administration will EVER cut the National Debt… because the moment we do, they’ll argue it’s proof people are “over taxed” and therefore deserve a tax cut.) The result? Not one but TWO massive Recessions (the second nearly destroying the GLOBAL economy) and turning a budget SURPLUS into a $1.4 TRILLION annual DEFICIT. That mess was handed to President Obama in 2008, who raised taxes on the wealthy again, cut the deficit, and took unemployment back down to under 5.0% again. And here we go again. Trump’s new tax plan is “Voodoo Economics” on steroids. Trump’s Treasury Secretary Steve Mnuchin (who ironically needs a “new chin”) made the rounds yesterday pushing this ridiculous strategy once again like no one has ever tried it before, insisting that isn’t a massive tax cut for the rich and that “trickle down economics” works. In a move that was almost comical, Mnuchin started to qualify his plan as not a massive “INCOME” tax cut for the rich after it was pointed out that slashing the Estate Tax… which multi-millionaire Mnuchin kept using the GOP trick of calling it a “death tax” to make it sound ridiculous & unfair… from 35% to just 20%… meaning a loss of tens of billions in tax revenue all going to the top 2/10ths of 1%. Trump unveiled his tax plan a speech where he assured his idiot followers that it was NOT in fact “a huge tax cut for rich people like myself… Believe me.” A little tip: any time Trump says “Believe me”, he’s lying. And all these economic (and environmental) policies that decimated Puerto Rico are about to be tried on the U.S. as a whole. But don’t worry, they won’t fail THIS time.